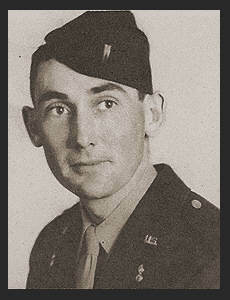 1st Lt. Charley R. Barbee, son of Mr. and Mrs. Frank Barbee, attended Frederick High School. Entered the Army in June, 1942, trained in Ft. Sill, Okla., Camp Carson, Colo., Aberdeen, Md., Camp Bowie, Texas; served in England, France, Belgium, Luxembourg, Germany, Czechoslovakia and Austria. Awarded ETO Ribbon with six Battle Stars, Pres. Unit Citation.